Beautiful You: Blogmas Day 20 | Christmas Treats! Blogmas Day 20 | Christmas Treats! So as I mentioned yesterday me and sister made some festive treats and they were so cute so I thought that I would share them with you all. They aren't hard at all so it would be such a good idea for something festive to do with kids and ours turned out great! 1. Separate the white marshmallows from the pink ones, pretty sure you don't want pink snowmen! 2. Make the icing, I made 20 snowmen as that was how many marshmallows I had, so I had to keep making more batches of icing as I never quite made enough. 3. 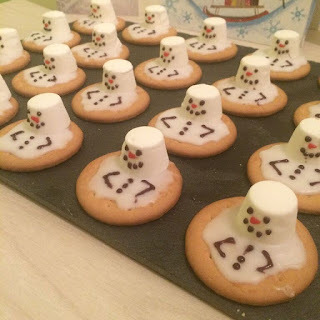 Spread the icing on the biscuit so it looks like a puddle and stick one of the marshmallows at the top for the snowman's head. 4. I let the icing set for a while and then I started to add the detailed decorations- all you need to do it get the black writing icing and pipe the arms, buttons, eyes and the mouth. Then get the red (sorry they didn't have orange) icing and pipe a little carrot nose on! Taaadaaaa- you have yourself a melting snowman biscuit! These are so easy but really effective, this took me back to my childhood when we used to decorate biscuits all the time and they still taste as great. 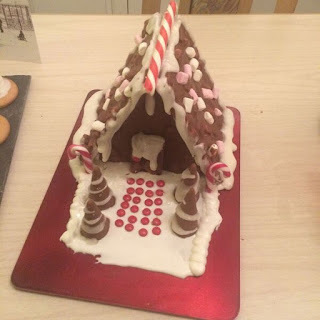 This is a pre-designed kit that we bought from Asda, originally we wanted to get a gingerbread house but they didn't have any so we went for this instead. 1. Separate the marshmallows into three piles and the biscuit into two. 2. Melt the first packet of chocolate pieces, cover the trees and then leave them to set on a plate. 3. Add one pile of the biscuit and marshmallows to the rest of the melted chocolate and then fill up the molds, add half of the last pile or marshmallows to the square section for decoration. 4. Leave the mold in the fridge until the chocolate is hard and fully set, removed and set these pieces aside for later. 5. Repeat sets 3 and 4 so you have two of each piece. 6. Assemble your house as you would like with the icing provided! There you have it an enchanted elf cottage, the packaging of the box explains it better than I do but I thought that I would just include it in case you wanted to make it without buying the kit. So that was what my sister and I got up to yesterday afternoon and it definitely made me feel a lot more festive and they both taste amazing! We are going to be attempting to make reindeer gingerbread when we get to my brothers so hopefully I will be able to share that with you all too, keep an eye out. Also let me know in the comments below if you have any ideas of cool Christmas treat ideas because I would love to make more!